Made with 100% alpaca fiber, hand spun and hand knitted here on the farm. They are comfortable, light weight and are available in tan and dark brown. We will have them in different colors and textures. They are $15.00 a pair. 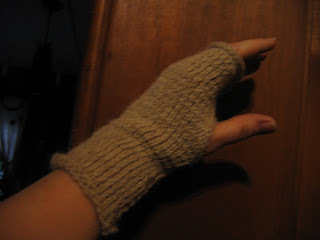 We also have regular Alpaca gloves for sale as well as scarfs, hats and many more items. If you are interested give us a call. We also ship anywhere in the U.S.